If you are looking for an effective medicine to cleanse your intestines or relieve constipation, thus senna tea will be your great helper. You may not have heard, but plant is a rare and very useful. Before going to various benefits for health, skin and hair, let’s first understand what this beneficial plant. Senna belongs to Fabaceae, a family of broad-leaved plants growing in tropical regions. There are flowers yellow, white and pink. In Asia, is mostly found in temperate regions of India and China. The leaves, flowers and extracts of senna have been used as laxatives in alternative medicine for centuries. 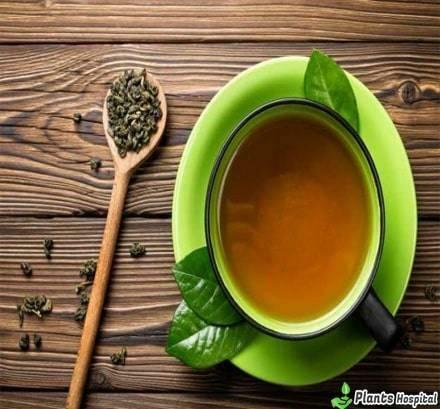 This plant is also among various herbal teas used to remove bloating and lose weight. Senna, Ex Lax, Fletcher’s Castoria and Senokot under commercial names such as many lax is used in medicine. Side effects include abdominal cramps, sudden weight loss due to prolonged use. Cleanser is considered a plant. In addition, can be used in various skin diseases by turning leaves into putty. In this way, is used to treat acne. Senna tea has both bitter and sweet options. Therefore, most of the time, can be mixed with green tea. If tea is bitter, honey can be added to increase flavor. Senna tea is marketed as a remedy for constipation and detox tea, is also used to help weight loss. Because of ability to treat constipation, is sometimes used for short-term treatment of hemorrhoids. However, there is not enough scientific evidence for use of senna tea for hemorrhoids or weight loss. While you struggle with constipation, senna tea can be your best friend. For this reason, you may prefer plant or capsule of senna. The tea is also very useful. After drinking tea, within 6-12 hours following, an activity will be seen in intestines. Since senna tea can help to expel out toxins in body, is often recommended for weight loss. While consuming this laxative tea, bowel movements are faster. However, effect of this tea on weight loss is mostly due to water loss. Therefore, a proper diet and exercise are necessary for full effect of tea. In addition to laxative effect, some of ingredients found in senna tea also have anti-parasitic infection properties. 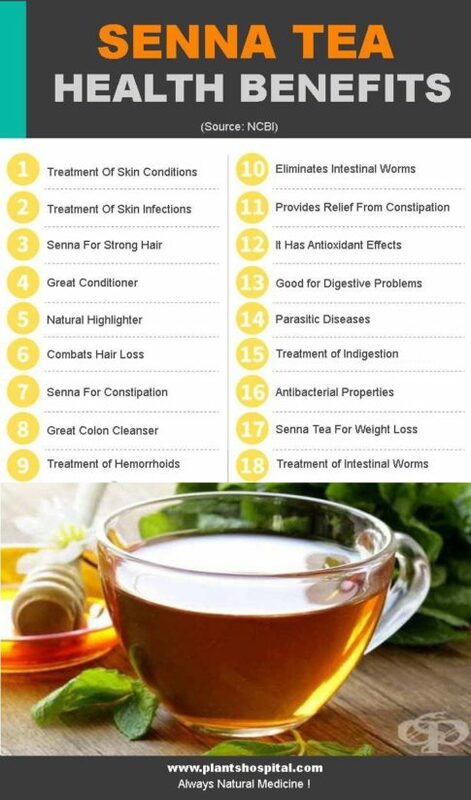 By removing worms and other parasites in intestine, this tea can help you get as much nutrients from food as possible. If you are having problems with constipation, bloating, cramps or indigestion, juice of senna can help increase flow of food and waste from intestines. Although rapid emptying of intestines can sometimes cause temporary swelling, overall improvement of your digestive system will be worth. Senna leaves not only contain laxative effect components, but also contain other active substances that act as antioxidants. These substances; can help reduce occurrence of these risks in body by fighting stress, chronic diseases and even free radicals that cause cancer. This healthy tea, also known as diuretic. This helps to remove excessive amounts of salts, fats, toxins and water from body. 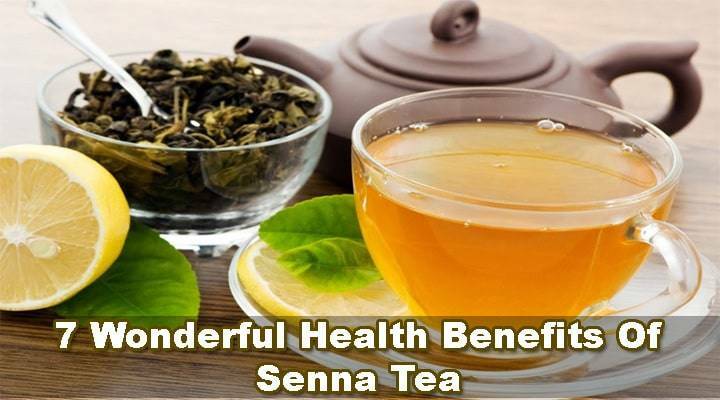 Excessive use of senna tea may cause loss of water in body, so be sure to drink plenty of water while using this tea. Senna tea has traditionally been used for conditions such as inflammation of joints and tissues. Studies on this subject show that is very effective for inflammations when used appropriately. When you feel constipated, you know may be a painful problem. Senna tea acts as an effective laxative to help relieve constipation by stimulating muscles in bowel. Senna tea can cause a few sudden side effects. Nausea, especially in long-term use. Faintness, which is usually seen as a result of diarrhea that causes water loss. Senna Tea Are Given To Children? Almost everyone experiences constipation at some point in their lives. Children are also included in this group; especially for children with bowel movements slow. Although senna is usually safe, you may have some concerns about whether or not it can be given to children. Experts state that senna is safe for short-term use in children older than 2 years. However, would be right to consult your doctor when giving a plant that has a laxative effect on children. How to Brewed Senna Tea? Although senna tea is now ready-made tea bags in markets, is best to take dried leaves from spice. To brew, all you have to do is put leaves of senna in boiling water and brew tea for about 10-12 minutes. Alternatively, ou can soak dried leaves in cold water for 10-12 hours. If you prefer cold water to benefit from benefits of senna, reducing risk of stomach cramps. When tea is brewed,drinking and drain water. After drinking 1 cup of tea, your relaxation will take place average of 6-12 hours. The best time to consume senna tea is to drink before going to bed to see effect next morning. If you want to add different flavours, you can also throw freshly sliced ginger while brewing senna tea. Do not overgrow tea and do not brew too much, longer you wait in water, the more bitter will taste and increase risk of stomach cramps.